John Deere Gator cab enclosures and roof from Side By Side Sports. Trying to stay out of the cold or heat? 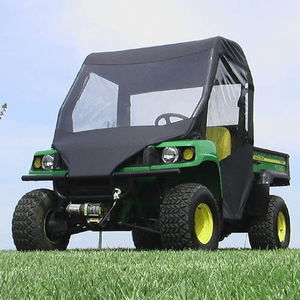 We have a wide variety of cab enclosures and heaters for your John Deere side by side utv. UTV enclosures serve many different purposes and come in many different options and materials. Some have doors and windows as well as roofs and tops. Call us anytime if you have questions about a cab enclosure or accessories for your John Deere Gator side by side.